Jacket has button and Velcro fastening. Jacket with attached frilled collar and trousers. 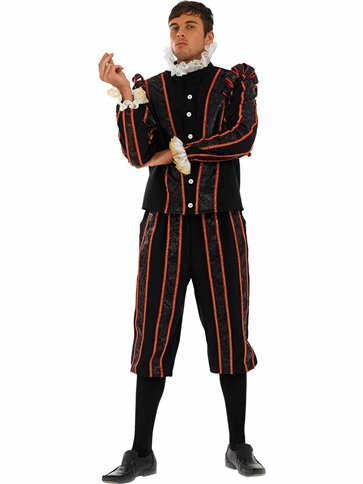 Go back to 1485 in this Tudor Earl costume which features a black jacket with button fastening, red and gold pinstripe detail, puffed shoulders and a white frill collar and cuffs. To finish off this historical costume also included are a pair of matching three-quarter length trousers with elasticated waist and two fully functional pockets. Want it Friday, 26 April? Order it within 2hrs and 5mins and choose Premium by 9pm Delivery at checkout.